Outlier or gold nugget? To reduce risk, ensure two (or more) UX research methods derive the same results. Tackle research questions using multiple perspectives and methods. Attitudinal research helps you understand how customers FEEL about a problem, solution, or experience. Behavioral research helps you understand how customers ACT. What, where, when, and how do customers behave? In self-reported research, customers report their own attitudes or behaviors. Use caution when choosing self-reported research methods — especially when a question relies on a customer’s (often faulty) memory. In observational research, researchers see customer behaviors and attitudes first-hand. During usability testing, I can observe a customer’s frustrations just by their facial expressions and don’t need to rely only on what they say. 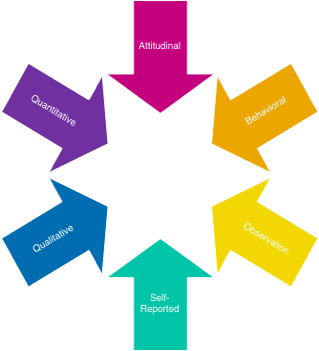 Qualitative research is used to understand underlying reasons, opinions, or motivations. It answers “why” something happens.